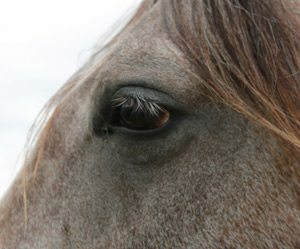 A well-known British hunting horse missing in mysterious circumstances for 10 days has been found trapped in a farm thicket. Josh, 28, retired from his hunting career earlier this year. The 17.2-hand giant was ridden by Beaufort Hunt secretary Nigel Maidment. Josh disappeared from his pasture in the village of Sherston 10 days ago. His disappearance was a complete mystery. Police were called amid fears he had been stolen. A social media campaign was launched and hunt club members and volunteers conducted extensive searches across the area. Local media also reported on the disappearance of Josh. The crucial breakthrough was made on Saturday morning when Hayley Godwin, who had been helping in the search for Josh, received a call of sounds being heard from a particular area on the farm. She checked it out and was able to spy Josh trapped within a dense thicket against a steep bank. He had got himself into the thicket, but had been unable to get out. Farmers Antony Tuck and Guy Bostock cleared a path into Josh and he was led to safety. Godwin said it was emotional to see Josh walk free from the thicket looking well and with such a bright eye. A veterinarian checked Josh over and, aside from a few scratches, he was fine.